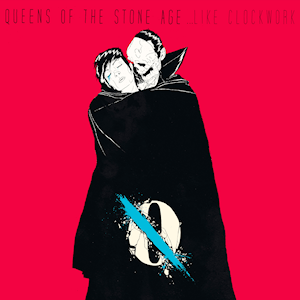 Album Review: Queens of the Stone Age – …Like Clockwork | Ranting About Music! Six years is a long time between albums for almost anyone, so it’s hard to imagine what it felt like for the typically prolific Queens of the Stone Age frontman Josh Homme. To be fair, Homme spent the time between 2007’s Era Vulgaris and now mostly busy: a rerelease and tour for Queen’s self-titled album, a new Eagles of Death Metal album, an album with supergroup Them Crooked Vultures, another child with wife Brody Dale, and a brief stint recovering from being, er, dead. Even after the medical treatment period, Homme spent awhile going through a sort of musical recovery of getting to the point where a new Queens album was a possibility. Part of this process was retooling the band’s line-up. Bassist Michael Shuman, a last minute addition to the Era Vulgaris sessions and tour, multi-instrumentalist Dean Fertita (Jack White’s go-to keyboardist), and a trio of drummers–Joey Castillo, Dave Grohl, and Jon Theodore–were recruited for the album, with Theodore going on to join the band for the tour. This line-up, plus longtime member Troy Van Leeuwen on guitars, makes for one of the most taut, and muscular versions of the band yet. …Like Clockwork also features a battery of contributing backing vocalists from long term Queens associates like Mark Lanegan, Nick Oliveri, and Brody Dale to newcomers Trent Reznor, Alex Turner of Arctic Monkeys, Jake Shears of Scissor Sisters, and Elton John, who also contributes piano. These collaborations are more “friends hanging out for a day and recording material” than “Queens of the Stone Age featuring ______”. That’s not to say it isn’t entertaining to hear Reznor on the chorus of the dementedly poppy “Kalopsia”, or John, Lanegan, and Oliveri howling in “Fairweather Friends”, but the guests never define the tracks they appear on like we’re used to with musical cameos. So, with all of this involvement from members in and out of the band, how does …Like Clockwork compare to the rest of Queens’ discography? It’s one of their most cohesive albums, and deftly, their most ambitious; even if …Like Clockwork isn’t the band’s longest or most sprawling work, it feels the most deliberate, almost as though it could be a concept album. It’s less playful than Era Vulgaris, more focused than Lullabies to Paralyze, and not as kooky as any of the band’s more “stoner rock” albums. The sunbeaten production and tones are still present; guitars both distorted and clean still sound bone-dry and the drums still punch their robo-funk rhythms mercilessly. From the sinister fuzzy bass, sparse guitars, and bleak vocals of opener “Keep Your Eyes Peeled” to the somber closing track, …Like Clockwork isn’t afraid to get dark. Penultimate track “I Appear Missing”, a six minute epic that is arguably the best song on the album, has a psychedelic but menacing mood, including a guitar solo and outro that ranks as one of the band’s finest moments. “Kalopsia” bounces between some of Queens’ quietest, prettiest verses and their own twisted interpretation of pop rock. The album’s biggest misfire, “The Vampyre of Time and Memory” comes in as track 3, but its off-kilter carnival piano throws the pace of the album’s first half. The record’s first half is mostly groove-heavy rockers. “I Sat By The Ocean”, with it’s catchy riff and lean beat, could pass as a solid single, whereas the taunting “If I Had a Tail” gets closer to the band’s past sleazy decadence. This half culminates in the blistering rush of lead single “My God Is the Sun”. The second half of the album gets more experimental; in addition to the previously mentioned songs, “Fairweather Friends” features Elton John adding a bit of piano to the loosest jam on the album, and “Smooth Sailing” delivers funk and falsettos that sound like a long lost sister to Songs for the Deaf. On the first few listens, …Like Clockwork satisfies enough to keep you interested, but it gets better with each listen. It’s not wholly perfect, but it packs a hell of a punch, and Homme’s lyrics, vocals, and playing are in top form here. Few bands sound this energetic six albums in, and here’s hoping that it doesn’t take as many years for Queens’ next effort; 4/5. This entry was posted in Album Reviews and tagged album, Like Clockwork, music, My God Is the Sun, queens of the stone age, review, rock. Bookmark the permalink.